The Popular Front for the Liberation of Palestine announced the cancellation of its planned anniversary events, including the central festival scheduled for Gaza City on Saturday, and transforming those events into marches of anger to confront U.S. imperialism and Zionism following Trump’s declaration on Jerusalem. In a press conference on Thursday, the Front said that a march will begin on Saturday at 12 noon in Gaza under the slogan, “The revolution continues until return and the liberation of Jerusalem.” The march in Gaza City will be held simultaneously with a march in Ramallah organized by the PFLP. The Front invited the Palestinian masses in all of their national and popular sectors to participate in these actions and noted that it considers December 11 to be a day of confrontation of the Zionist forces. It also emphasizes that the Palestinian people are entering a new stage of struggle to establish a national strategy in which all Palestinian movements are united to serve the objectives of our people through resistance and confrontation of the occupation in all locations. The PFLP also emphasized that its march of anger and revolution will raise its voice against U.S. imperialism, Zionist colonialism and Arab reactionary collusion. It demanded the Palestinian Authority end its continued reliance on negotiations and end security coordination with the occupier. It called on the Arab and Islamic nations and peoples and all supporters of justice in the world to take to the streets and squares to reject Trump’s declaration and to confront all forms of attack against the Palestinian and Arab people. 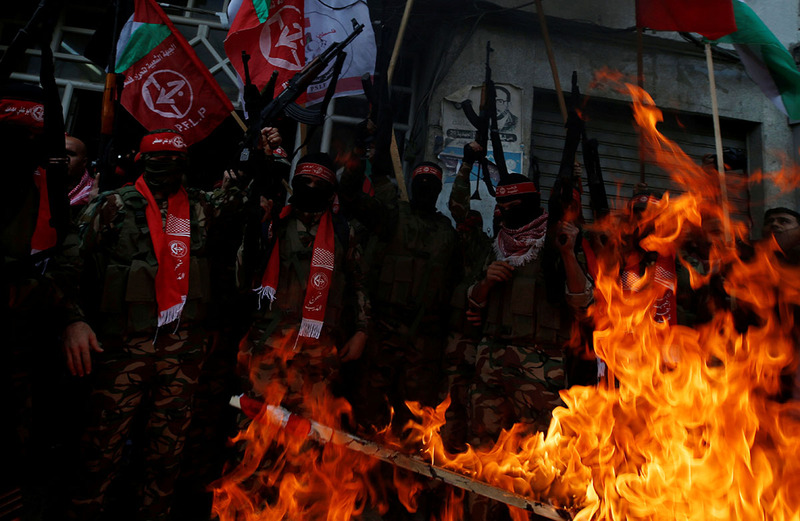 For its part, the Abu Ali Mustafa Brigades emphasized that it is open to targeting U.S. interests, especially on Palestinian land, in response to this action. “We confirm that the U.S. imperialist enemy is not welcome on Palestinian land,” said a spokesperson for AAMB. The AAMB spokesperson added that the rights of the Palestinian people to their land cannot be revoked by an American decision or an act of any state, and noted that the U.S. puts its interests on the land of Palestine in the eye of the target for Palestinian resistance and the Palestinian people.